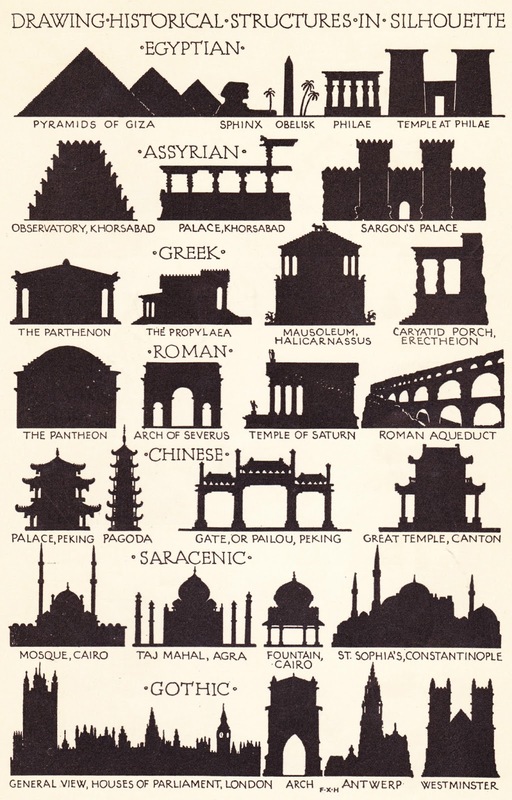 On this page, Henke illustrates well-known structures such as the Pyramids of Giza, the Parthenon, the Taj Mahal, and Westminster Abbey. There are also a number of structures that might not be as familiar to the general populace these days. The second row continues three mighty edifices from what is now Khorsabad, Iraq, but was once, many centuries before Christ, the Assyrian capital of Dur-Sharrukin. King Sargon II's city included this observatory2 and grand palaces. It was excavated during the middle of the 19th century, when Dur-Sharrukin was, for a time, mistaken for Nineveh, a later Assyrian capital that is believed to have once been the largest city in the world. In March 2015, Khorsabad, which is about 12 miles northeast of Mosul, was extensively damaged and ransacked by the terrorist/military group ISIS. Last month, National Geographic provided an update, with the help of satellite imagery, of what is currently known about Dur-Sharrukin/Khorsabad. The article is title "Iconic Ancient Sites Ravaged in ISIS’s Last Stand in Iraq." 1. Interestingly, though, it looks like his name kept being handed down. I found multiple online references to businessmen who I can only assume are his descendants — Frank Xavier Henke III and Frank Xavier Henke IV. 2. Some illustrations of the "Observatory," which is also called a temple by some: 1. Conjectural Restoration at All Mesopotamia Tumblr, 2. 1867 engraving of reconstruction, from Getty Images, 3. "Actual Condition of the So-Called Observatory," and illustration from an 1884 book.